Our subscribers would love to hear about it. 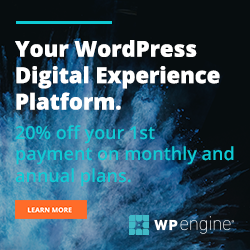 WP App Store runs advertising for WordPress products such as plugins, themes, WordPress managed hosting and other WordPress products and services. Take a look at the kinds of deals we've run in the past. Deals are booked on a first-come-first-served basis. The next available slot is 23rd Apr 2019. If you’re interested, contact us below with details about your product and we’ll see if it’s a fit.